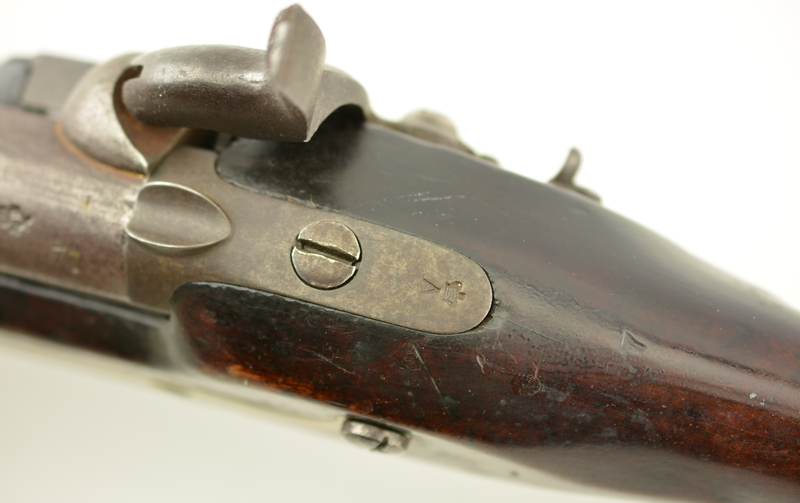 Description: 1836 dated Manton percussion carbine crown WR, tower & crown marked percussion lock. 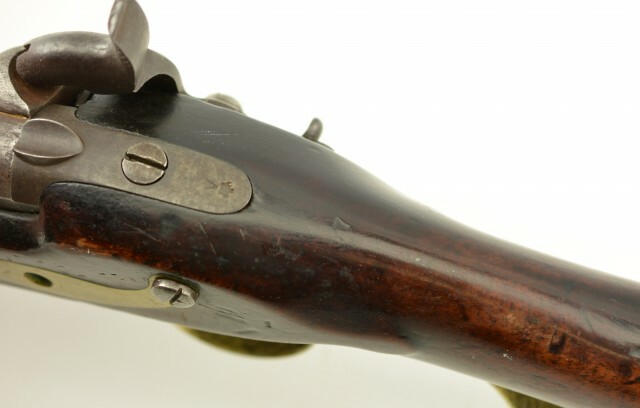 This is a very rare British military carbine with only 30 examples built in percussion. 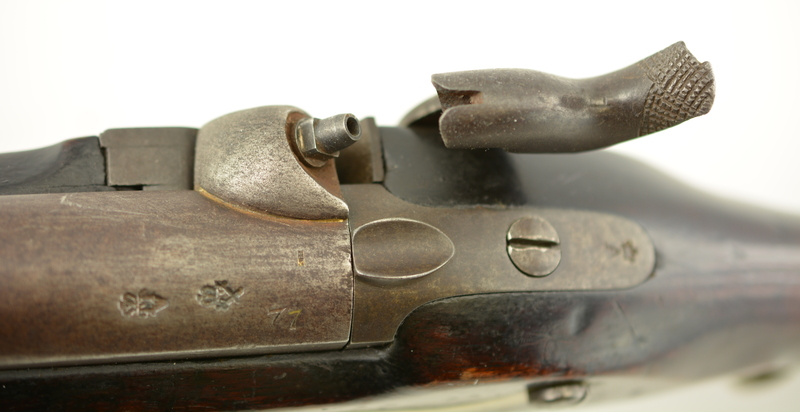 This piece retains all of the original configurations of the flint carbine. For reference see the 6 page article written by the late James Gooding in Vol 51 number 9 February 2006 . 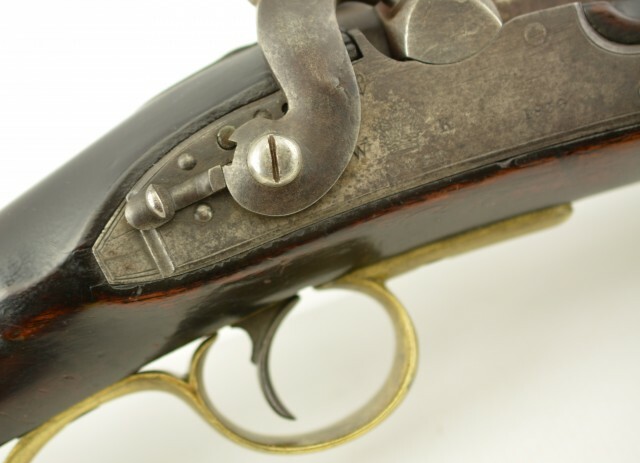 The gun report (photocopies included)Mr. Gooding reported that working in cooperation with Howard Blackmore they concluded that only 30 Manton carbines were converted to percussion see pages 28 to 31 of the aforesaid article. 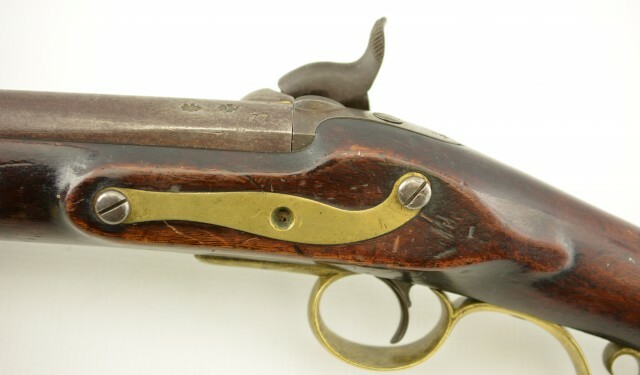 The carbine as offered shows an additional modification . 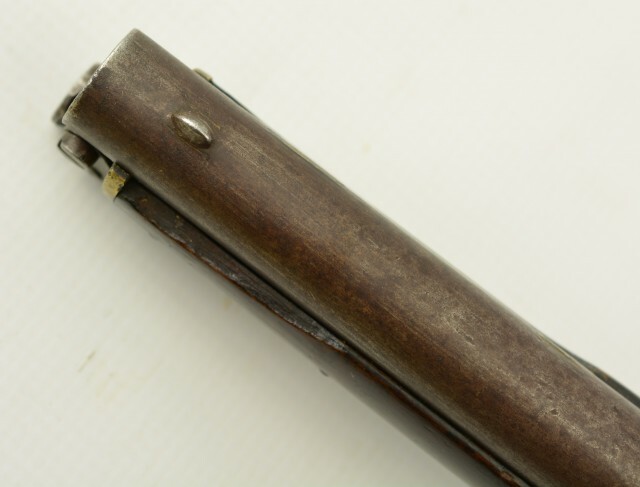 You will note that the right side of the stock shows removal of wood and outlines on the barrel where a bayonet lug (sword bar) had been affixed. the lug appears to be of a style typical of earlier and some later British Military rifles. This piece is missing it's original 6" sling bar but shows evidence that one was previously mounted. 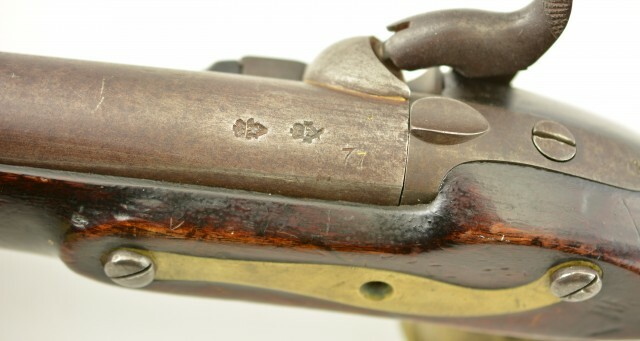 This carbine shows a very good bore, overall brown patina on the barrel with clear barrel proofs and barrel makers mark. 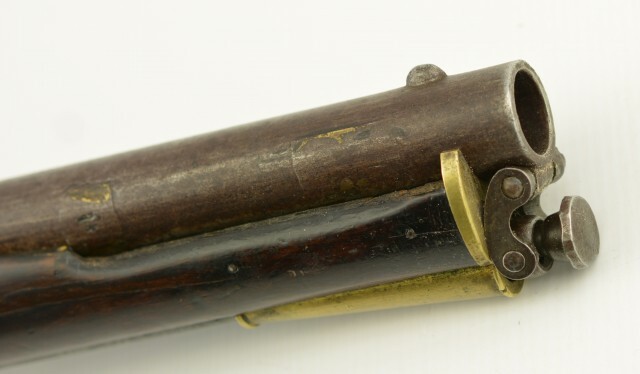 The lock shows clear markings and a working bolt. 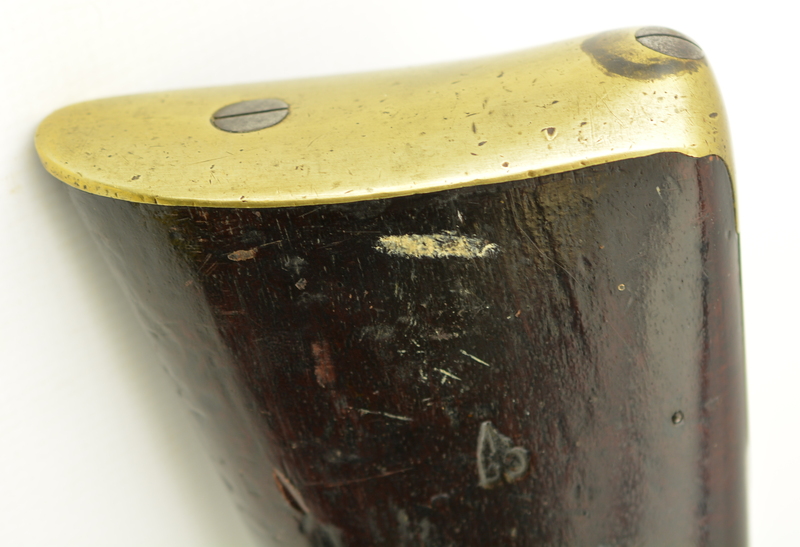 The hammer shows a small ship on the top outer edge. 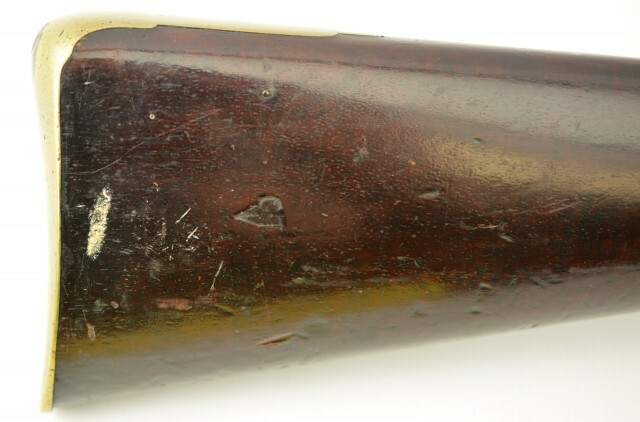 The wood shows remnants of the original finish. BO broad arrow mark, inspectors mark and the contractors (setters) mark "POTTS" see table. 1. A page 30 including ordnance contractors including Thomas Potts. This carbine retains all of the original brass fittings. 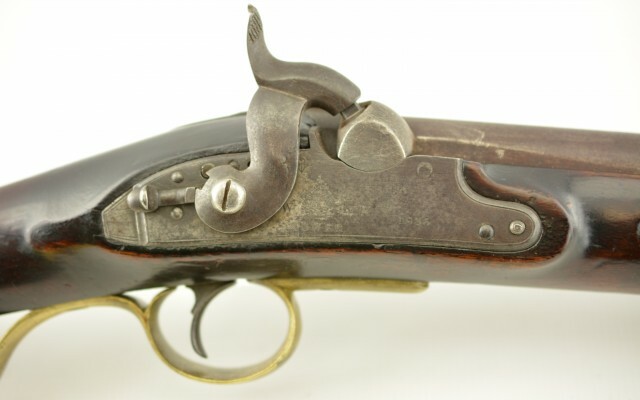 At the very end of the flintlock era, the Manton carbine appeared only to be overtaken by the percussion era. There are very few original flintlock carbines available to the collector community. Page 31 of the aforesaid article sums up Blackmore's information that 1000 mantons were ordered. 990 delivered, 30 converted to percussion and the 700 detached locks as offered by Bannerman in 1907 . 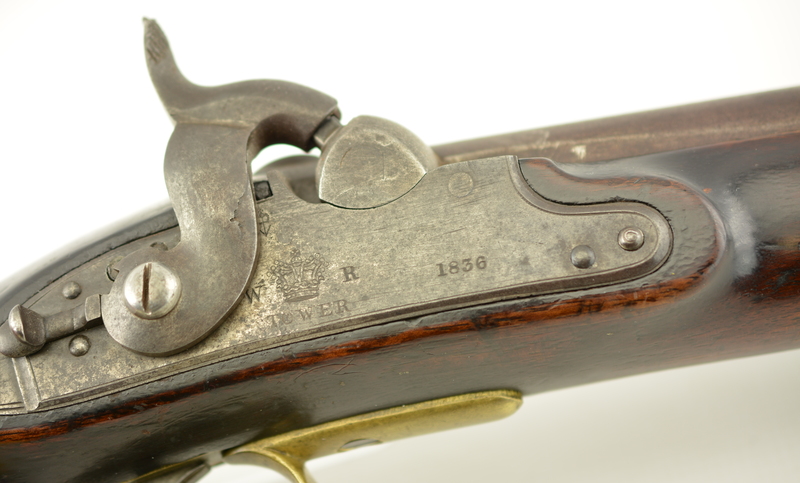 Jim Gooding's conclusion was that very few flint manton carbines and probably fewer percussion manton carbines have survived. 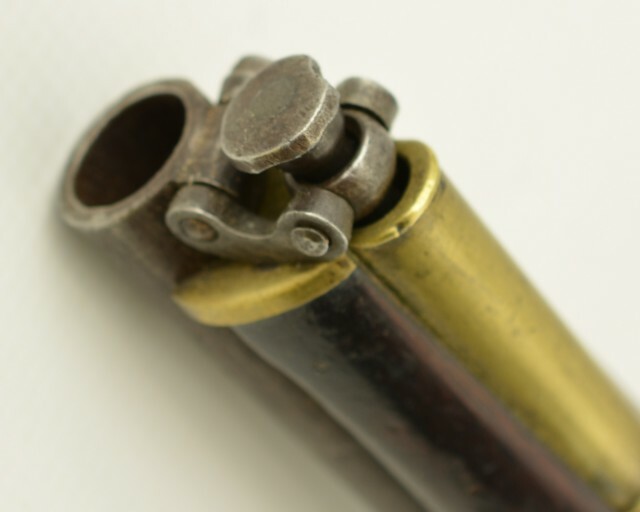 The remnants of the mounted sword bar would suggest that there was consideration or trials for usage of these carbines by artillery units. This item is a very rare example of a British Military carbine. A piece for the serious British Military Collector.